Measures: Open: 6" x 4.25" x .1" / 15cm x 11cm x 2.5cm. Folded: 4.25" x 3" x 1" / 11cm x 7.5cm x 2.5cm. Maximum squeeze and juice! No sticky finger mess! Patented whimsical heart shapes allows you to pick up the wedge with the front end, position wedge in place and squeeze to get every drop! The best wedge juicer on earth! With some practice, extract all the juice from your citrus wedges without getting anything on your hands. 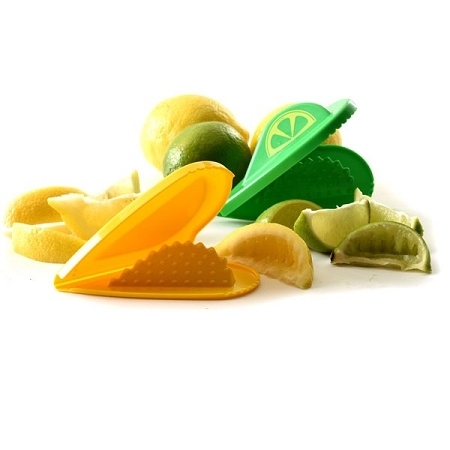 Perfect when you want to make fresh lemonade or limeade. Add fresh lemon or lime juice into beverages and onto your food. Great for recipes that call for fresh squeezed lemon or lime juice. The narrow causeway is perfect for adding flavor to your water bottles and drinks. Reward Points 87 points will be rewarded to you when you buy this item. Norpro BEECHWOOD HONEY DIPPER, CARDED 6" x 1" x 1"